When the final seconds slipped off the clock at the Huntsman Center on Saturday night, the Utes having defeated UCLA by the count of 92-81, it was time to reflect upon a regular season just ended. The punctuation itself deserved mention and was indicative of the campaign in its entirety, Utah gaining its 17th win against 13 losses. 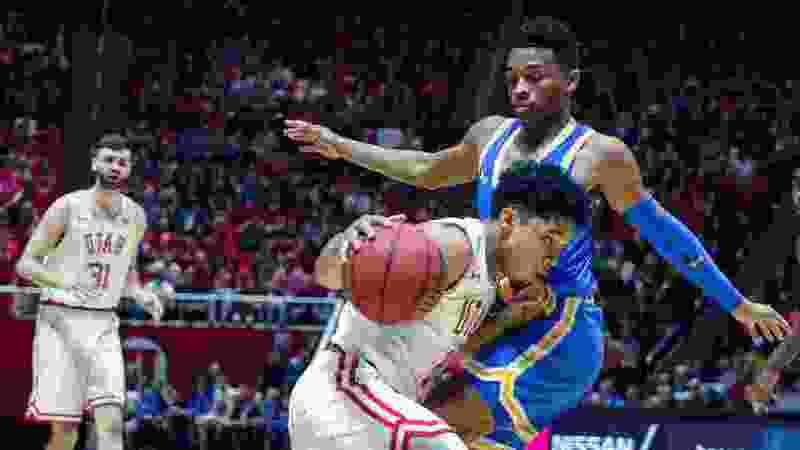 The victory was nowhere near as dramatic as the one the Utes took from the Bruins in L.A. exactly one month before, a bit of scintillation that saw Utah climb back from a 22-point deficit over the last 13 minutes to famously clinch the thing on Parker Van Dyke’s 3-pointer as time expired. This one was more … what’s the word? … wandering. Fitting. Same as it ever was. The Utes crushed UCLA through the first half, extending a 16-6 lead to 22-10 to 42-22 to 51-31. Utah hit 11 3-pointers in the initial span. The second half was like the first, in reverse, the Bruins crawling back, basket by basket, but, ultimately, not enough to win. For all the blessings of the first 20 minutes, the latter 20 had everyone, including the Jazz’s Donovan Mitchell, peering through their fingers at the crumbling Utah debris. Thanks in large part to Sedrick Barefield, who had 29 points, an effort Larry Krystkowiak called “remarkable,” the Utes took the scattered bricks and rebuilt walls to victory. What all of this meant is that Utah will go into the Pac-12 tournament with a No. 3 seed, favorably positioned to threaten to do some damage there. Or, they could simply flame out. Who knows? What was more meaningful was that the Utes, herky-jerky as they were, outdid themselves this season, having been picked to finish eighth in a league that wasn’t supposed to be all that good. It was worse than expected, but the Utes were better. They bobbed and weaved through it to the best of their modest ability, finishing their league record at 11-7. If it is a coach’s primary charge to haul as much out of his players as possible, Krystkowiak did his share of hauling. The Utes beat UCLA home and away. They beat Arizona here. They split with Arizona State. They beat Stanford on the road. They swept USC. They split with Colorado. They got doubled up on by the league’s best team, Washington. And well … you get the idea. Not a thrill. Not an embarrassment. It was much closer to the former than the latter, satisfying for the patient, for those who don’t spend too much time focusing in on Krystkowiak’s $3.4 million salary, focusing in on the high-water marks of distant seasons gone by. The NCAA Tournament is getting to be a dusty memory. As they now turn toward the league’s postseason affair, these particular Utes have a chance to cause some concern, regardless of how the odds stack up or down. They likely won’t do what they would have to do to qualify for the NCAA affair — win everything in Vegas. They’d have better luck at any of the casinos’ craps tables. But Barefield, one of a handful of seniors honored at the end of Saturday night’s game, was right when he called for his team to just play with joy, with happiness in their hooping hearts. This Utah team was, after all, fun to watch, at times. Beating UCLA, again, was one of them. The Utes shot the ball well — hitting 46 percent, 45 from deep. They passed it — 16 assists. They ran the floor. They defended — at least here and there. And when the contest was over, they bumped chests, rubbed each others’ heads, slapped hands, and grinned wide. There was fulfillment in most of it, a gassed-up tank of potential, even if that filling came on a sliding scale. This isn’t meant to sound patronizing, not a good-job-good-effort commentary. It’s meant to tell the truth, that the Utes this year humbly overachieved. And that’s pretty cool. Now, we’ll see if they can do more — do what no one in their right mind thought they could — win that Pac-12 tourney and go to a dance nobody’s imagination had enough elasticity in it to believe they’d be invited to. GORDON MONSON hosts “The Big Show” with Jake Scott weekdays from 3-7 p.m. on 97.5 FM and 1280 AM.